It all started about six weeks ago with yet another questionable purchase on Amazon Local: Hampton Court kayak experience for two with a glass of champagne, £29. Bargain, we thought, and went along to join two demographically identical couples for three hours of grinning clumsiness on the river. One thing lead to another, and before I knew what I was doing I’d “won” a red and yellow kayak on eBay, complete with paddle and bucketfuls of advice. A roof rack was acquired on the way to pick up the purchase, a buoyancy aid and spraydeck on the way back. Within one week of dipping a toe I’d jumped right in and was scaring ducks on the Thames. The draw? Much like cycling and trail riding, it’s about exploring places you wouldn’t normally go, doing it at your own pace, getting away from the crowds. Flinging yourself down waterfalls is for other folk. After a month of moist solo experience on the local river I was ready to meet other adventurers and hopefully find some new places to ‘put in’. A couple of introductory posts on a canoe forum later and I’m standing in a car park with three canoeists comparing folding saws and hatchets. One of them has a scythe. This wasn’t strictly what I expected when I posted my introduction, but my new found friends seem to know what they’re doing so I resolve to sit at the back of the class and treat this as a learning opportunity. Fran, Bob, and Mal seem really nice. I feel an instant affinity to anybody who keeps a tent and stove in their car at all times, though the amount of ‘bushcraft’ equipment being loaded into their canoes in front of me is a worry. Apparently the vegetation on the stretch of water we’re paddling this morning has a tendency close in if nobody’s been down that way for a while, so in the spirit of being prepared we’re packing the kind of kit list that would make Ray Mears and Bear Grylls look like girl guides. For the uninitiated it’s worth pausing for a moment to explain the difference between a canoe and a kayak. The former is a long, thin, open boat that you drive with a paddle while kneeling somewhere in the middle. The latter is a long, thin, closed boat that you drive with a paddle while sitting somewhere in the middle. Six weeks ago I was one of millions of people who’d use both terms interchangeably, now I know they’re as different as skis are from snowboards, as motorbikes from scooters, as snooker is from pool. So joining a canoe forum as a kayak owner probably wasn’t the smartest thing to do, yet instead of ridicule I’m met with a warm welcome. And the tongue-in-cheek warning that I may yet be tempted over to ‘the dark side’. We’ll see about that. We put in just upstream of Chertsey Bridge and start out on our friendly foursome adventure by passing through a lock, something I was thus far too nervous to try on my own. “No big deal” reckons Bob, just go where the lock keeper tells you and hold onto the chain. Minutes later we’re rising up to road level before being released on the other side – Bob was right. We all settle into a comfortable pace that’s perhaps a little slower than I’ve been getting used to while out solo. Maybe it’s because a kayak paddle has a wet bit at each end of the stick (that’s pro-talk by the way) while my canoe companions have to lift and dip theirs for each stroke. Maybe they’re just saving their energy. Half an hour later we’re landing on Desborough Island by way of ‘the beach’ – a narrow shingle bay that leads to ancient picnic tables in a clearing surrounded by sloe bushes. Fran brews a round of teas and snacks appear from somewhere. I’ve got a bottle of water and a plastic bag containing my phone and car keys – point taken. Mal motions to the bushes on the other bank and the alleged inlet for Abbey River, a thin channel cut by monks in the 11th century to supply and power their mill. 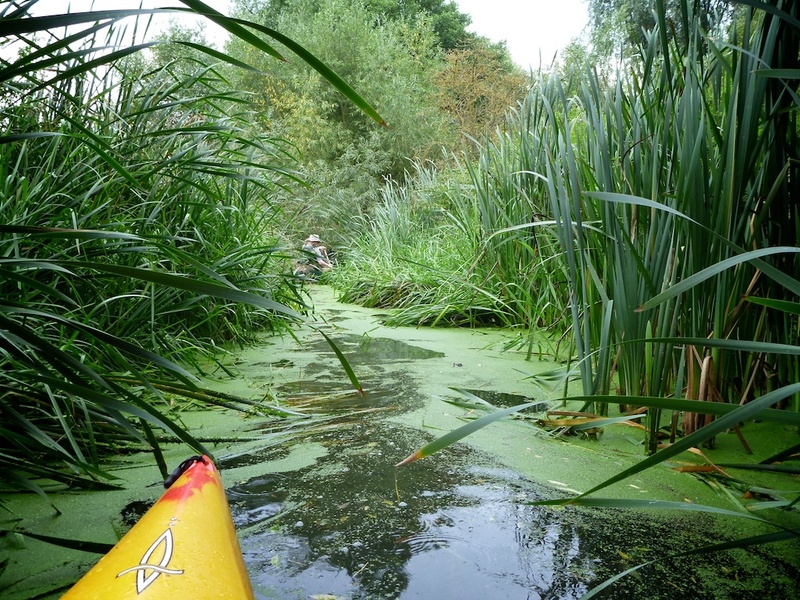 All I see is bushes and weeds, but before long we’re on the water again and heading for – lo and behold – a channel just wide enough for two canoes. Which is blocked almost immediately by a fallen willow. Mal and Fran are old hands at this and step over the bough while their canoes pass underneath, but then they’re not held captive by a spray deck and a near-terminal lack of experience. I opt for the limbo approach and for a moment it looks like my safety equipment will be the death of me, but in the end I struggle free. The fallen tree was a good indicator of things to come, and over the next three miles we encountered prickly bushes, sunken obstacles, more fallen logs, tall rushes, and a seemingly impenetrable expanse of water cabbage. “Let Fran go first, she’s got more weapons” jokes Bob, and sure enough she’s standing in her canoe, beating nine bells out of the obstacle before flinging the cut-offs aside. I like Fran. Mal makes a joke about alligators, and tells me that the last 300 yards of the Abbey River once detained him for over half an hour because it was just too overgrown. That’s not the case today (not with Fran around anyway) and we paddle peacefully through the sculptured private gardens of a large manor house, drifting in and out of a carpet of water lilies as the sunlight plays on still waters all around.